…I was one of those people who received limited info about dialysis, and when I went to the center for the first time, I expected an introduction to the process, maybe a short tour around the clinical setting, to familiarize myself with the noise, the machines, and the process. What actually happened was that I was welcomed by the receptionist and told to have a seat, that someone would be with me in a minute. After a short time, the big door swung open and my name was called. I entered the clinical setting for the first time, blinking at the bright lights and loud noises. I was escorted to the scale, weighed, taken to a chair, b/p cuff put on, arm examined, then came the needle sticks. OMG. I don’t consider myself a weak woman; in fact, just the opposite. However, the pain of those sticks (4 that day-first tech couldn’t get it) came as a brutal surprise. I had had no preparation for the pain. Nobody wears a nametag, so I did not know who were the RNs, the techs, the MDs, the staff-who are all these people and what the hell are you doing to my arm????? I went home in a state of shock and almost didn’t go back 2 days later. How could I have not known how brutal dialysis is? In spite of the rising fear, I took my now blue and black arm, and heavy heart back for another torture session. The second time was worse than the first. The person sticking me cause huge hematomas, and took 5 sticks to get me plugged in. I knew there had to be a better way, so I took myself to the social worker’s office, even though I had not yet been introduced to her, and told her I was not able to tolerate the process, due to the pain. She went and got the clinical coordinator, who I had not yet me. He told me about lidocaine cream, which applied as an ointment, was effective in reducing pain. He also suggested that staff use a smaller gauge needle, not the 15g that tore up my arm. He asked if I had been exercising my arm, something I knew nothing about. He did some education with me, explaining the rudiments of dialysis. EVERYTHING changed once I bought the lidocane ointment ($28. for 30 Grams). I apply it to the access site 30 minutes before venipuncture, and the difference is amazing. I am now a much happier client. MUCH. The terrible thing is that she suffered unnecessarily as many of us do in those first days but the good thing is she contacted her Social Worker and got some much needed help and advice. Thank you, Tutu, for telling us about your experience. It’s my hope that the ESRD Network I work with will develop a guide for new patients and perhaps keep others from having this bad experience. This entry was posted in activism, dialysis, ESRD, New Patient, ointment, pain, patient care, Patient-Centered Care, Social Work and tagged dialysis, ESRD, hemodialysis, kidney, patient, patient care, patient-centered care. Bookmark the permalink. Thank you so much for this information. 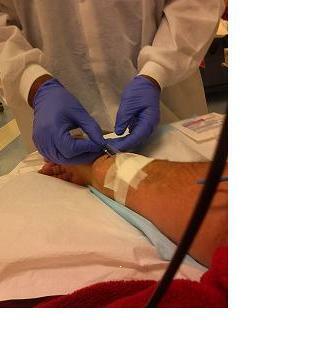 I have had a fistula made in my arm and am not on dialysis as of yet. I have started researching dialysis and organ transplant and discovered that transplant is a much better option. The book that is changing my life is “Shift Your Fate” by Risa Simon. I highly recommend it. I am no longer in the dark about dialysis and kidney transplant and am so happy to have found this resource. We need to gain as much information as we possibly can to live the best and longest lives possible. Thank you for letting me share and for your service.